So yeah, I caved and grabbed Pulsefire Ezreal, so let’s take a quick look at League of Legends first ‘theme.’ As a side note, I’d like to see more themes, even if they don’t come bundled with a skin. Like… Piltover concept art theme for a few hundred RP. Come on, Riot, that’s easy money right there. Let’s start off with the skin because, well, that’s what you all care about when it comes to this thing. Riot has absolutely outdone themselves with this thing and PFE is the bar at which all theme skins are going to be judged by. The model looks absolutely great and the evolution at levels six, eleven, and sixteen are a really nice touch. Everything has been completely redone and this thing could pass for a damn fine 975 RP skin on its own. My real bit of excitement though if the voice acting. Kyle Herbert, Ezreal’s voice actor, really brings it all with this. It still sounds like Ezreal, but an older, cockier, and slightly more jaded one. He still retains his youthfulness, but it’s tempered with mentions of a ‘grimdark future.’ I would absolutely kill for more skins from the ‘Pulsefire Universe,’ or some hastily written little fluff about exactly how grimdark that future is. 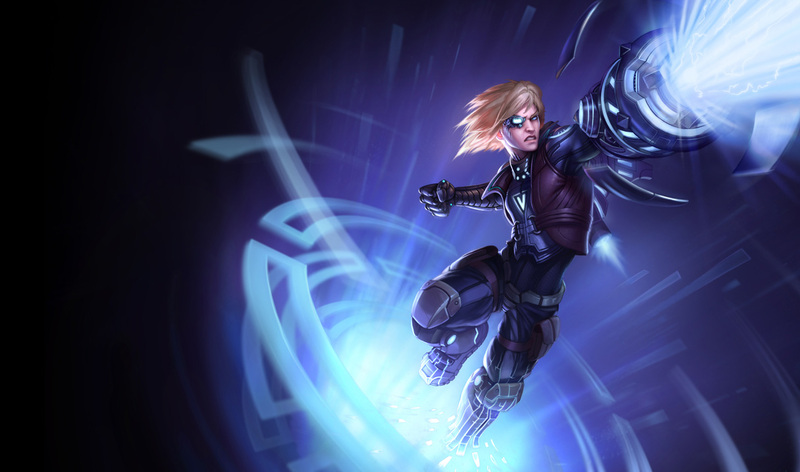 Oh, and Pulsefire Ezreal not only has himself, but also the suit’s AI, PEARL. Every time Ezreal learns a new spell, teleports back to base, and even uses some summoner spells (Teleport was the only one I’ve noticed so far), you get a special little voice clip. Like I said, Riot has completely outdone themselves this time. As far as the actual theme part goes, it’s pretty nifty. You get a Pulsefire Blast (yeah I don’t know what to call the thing except that) summoner icon and a Pulsefire Ezreal profile banner. My only problem is that you can’t use them separately, because while I love the banner (it beats having an old wizard), I’m pretty fond of my Ancient Golem icon. So, yeah. All in all, Pulsefire Ezreal was a great purchase, but I’m a sucker for this kind of thing. If you really love the prodigal explorer or sci-fi stuff, definitely pick it up while it’s on sale (half price, 1625 RP) for the next four days. This entry was posted in League of Legends, Video Games and tagged ezreal theme skin, league of legends ezreal skin, league pulsefire ezreal, pulse fire ezreal lol, pulsefire ezreal theme. Bookmark the permalink.